My name is Larry Heidinger. I grew up on a farm near Stickney pretty close to where I currently live. I am a self-employed auto mechanic and run a small cow-calf operation. I went to church off and on all my life and did my share of partying in my earlier days. It seems like I always knew who Jesus was, but that was as far as it went. I knew facts – there was no relationship. In 2 Peter 3:9 it says, “The Lord is not slow in keeping his promise, as some understand slowness. He is patient with you, not wanting anyone to perish, but everyone to come to repentance.” I thank God for being patient with me. When I look back at how I lived my life then and contemplate what would have happened if I were to have died, I’m pretty certain I would have gone to Hell. The turning point in my life was probably back in 1999 when my wife and I read the Bible together from front to back in a year. We attended some Bible studies and got more involved in church, all the time growing closer to God and striving to know Him better. I came to realize that it takes more than just going to church to get to Heaven. You need a relationship with our Lord, Jesus Christ. No one can get to Heaven on their own merit. It says in Romans 3:23, “for all have sinned and fall short of the glory of God.” Then in Romans 6:23, “For the wages of sin is death, but the gift of God is eternal life in Christ Jesus our Lord.” Wow! There’s no way that I could try to live life my way and get to Heaven. God has revealed himself to me by His love, grace, mercy, and through the power of the Holy Spirit. This has given me great peace, understanding and direction for my life. I have been blessed with my wife, Leanne, 5 children (Justin, Amber, Melissa, Sierra & Cora) and 2 grandchildren (Kalee & Kahne) and so much more. It is my prayer that you will be blessed by reading our testimonies and other information on this website. We would love to have you come be a part of our church family at the Lighthouse! 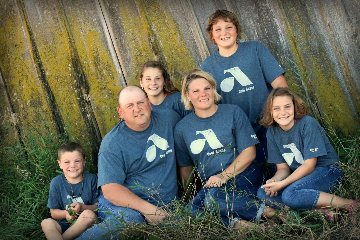 My name is Jared Gerlach and my wife Michele and I farm in the Corsica area with my brother and father. We have four children. I would like to share my testimony with you. Growing up in my church, we were not taught to have a personal relationship with God. We had baptism, confirmation and I guess I figured that that was all I needed. I remembered praying to God but never really knew what to say. But, I did keep praying. I always thought there was more to it but I didn’t really know what. When I met Michele and after dating for about a year we had talked about getting married. She said I had to ask her dad and I said sure no problem. In Dec of 1995 we went to her parents for Christmas and I was never so nervous in my life. Her dad had known that I was going to ask him because Michele had told him that we had talked about it. I remember when I got up the nerve to ask him he was like a little kid and grabbed his bible and notes and went into his office. We talked for quite a while but I was so nervous that I really don’t remember what we all talked about. But one thing I distinctly remember was that he asked me if I considered myself a Christian. I said that I was baptized and confirmed and that I did pray. I kind of got this deer in the headlight look from him. Then he asked me if I had ever asked God into my life. I said not really, I didn’t think so. He asked if I would like to and I said yes. We prayed for a while and I asked God into my life. Time went on and we got married. 3 years later we had our first son Josh. I remember my dad asking when are we going to have him baptized. Growing up in it, I figured we better get it done. Michele’s dad did do the baptism but he didn’t agree with the liturgy. I really didn’t understand why though until now. As time went on it seemed like nothing was really different anymore. It started feeling like the same rut as always. I did read the Bible and other books but eventually, fell away from it. In Nov 2004 I started having problems with anxiety. I shouldn’t say it but for a year I put my family through hell. Michele told me to pray but once again, I felt I didn’t know what to say. I did see a couple of doctors but I know what helped most was that I went to see a pastor friend of ours in Mitchell. Things started to get better but I was always thinking about myself and had a terrible fear that something was physically wrong with me. After a time things were looking up but then in 2009 Michele called and asked me to come home. She was very insistent and so I knew I needed to come home right away. When I got home I found Michele crying and she told me that the doctor had called and she had cervical cancer. After crying for a while, we started to pray. Once again we turned to a pastor friend that led both of us to seeking God and not giving in to fear. Michele had surgery and has since been cancer free. It was such a blessing from God. I didn’t want to admit it at the time but I think this was God’s way of opening my heart to not have fear about myself but to pray and trust him with myself and my family. When I give my problems to Him, I know that I can rest in the fact that He will do the rest. Since the kids started Awana at the Lighthouse church I remember bringing them here and was just blown away with everyone’s enthusiasm to worship and praise God. I wanted that for me and for my family. They also taught me that just because I was baptized and confirmed, I was not guaranteed to go to heaven. There was nothing that I could do to get into heaven. All I needed to do was put my trust in Jesus and believe in Him and I was in. That Jesus is the only way to heaven. One verse that I have made my own and even put on the side of my semi-truck is Philippians 4:13 – I can do all things through Christ who strengthens me. With Jesus by my side and I can do and get through all things. After all these years of not knowing what I was missing, my eyes and my heart have been opened and I am truly blessed.